For Pro Tools users, there are two Audio Suite plug-ins which transfer and process the selected Pro Tools audio in in as few as 2 or 3 keystrokes. Also, a Pro Tools monitor plug-in is included with Revoice Pro that, once installed, allows you to hear audio playback from Revoice Pro through the DAW's audio outputs. It also lets Revoice Pro optionally lock to the DAW's playback with sample-accurate sync. This lets you check processed audio "in place" with DAW audio and video before you transfer it from Revoice Pro back to the DAW. When using these plug-ins, a dedicated Session is created in Revoice Pro named >Audio Suite<. This session can only contain one process and one piece of audio in each track. When you add new audio to a track, the previous audio is removed. This allows these plug-ins to largely emulate the simplicity of a VocALign Audio Suite Plug-in. This means, in many cases, because the actions taking place in the Revoice Pro program are totally automated, the Revoice Pro window can actually be ignored. 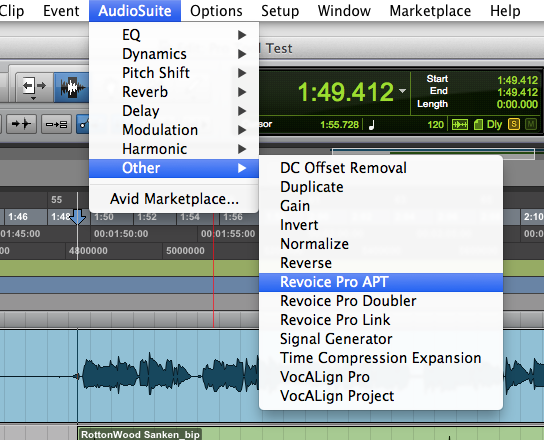 You have the option to modify any of Revoice Pro's settings to change or improve the results. This Revoice Pro session, however, will lose these changes once new audio is captured or the >Audio Suite< Session is closed, except for changes saved to the Default User Presets. The plug-ins should be used once the user has a good understanding of the APT and Doubler processing controls and settings. Also, before you process audio with the plug-ins, we recommend you save the APT or Doubler processing settings that you want to use as the Default User Preset for the APT or Doubler before you use the processes. The two "Quick" plug-ins can be found in the Pro Tools Audio Suite “Other” plug-in menu (along with the Revoice Pro Link plug-in, which can still be used). The following simple approach will work in many cases (APT example). Select the Guide Audio in Pro Tools and press the Revoice Pro APT Capture button. Select the Dub Audio in Pro Tools and Press the Revoice Pro APT Capture button. If the whole output signal seems wrong, change the processing settings and redo it.